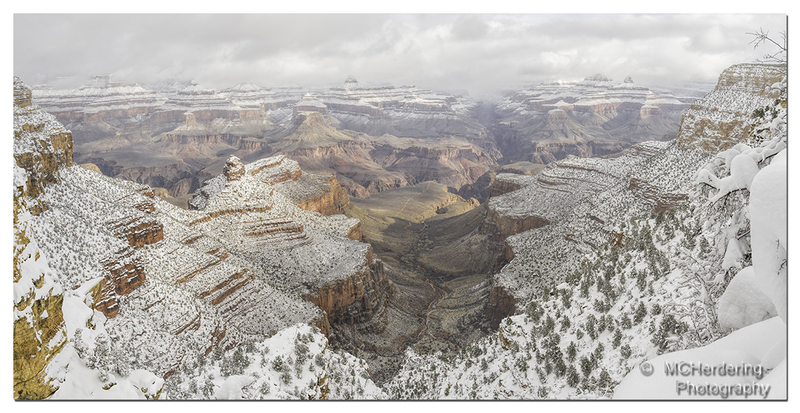 Taken about an hour after sunrise, while the snow still fell, this shot indicates the levels at which the snow sticks in the Grand Canyon. The average low temperatures at the bottom of the canyon are in the high thirties, so snow probably seldom hits the ground there. At various levels it does stick, but with the sunshine peeking through the clouds and heating the canyon floor, the heat rises and gradually melts it throughout the day.